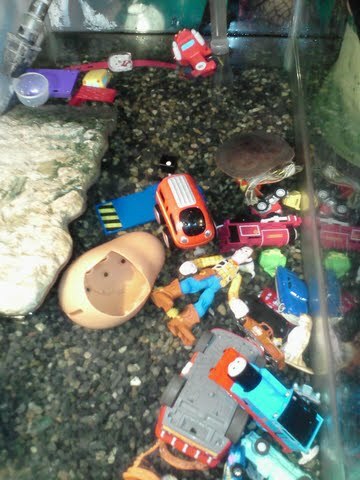 My wonderful almost four year old son Sawyer "Monster" decided to share with the turtles yesterday. He shared Woody, his cars and some other fun toys with his older brother's two turtles "Mr. Nibbles" and "Herbie". You know events like this just don't happen on a daily occurance and a picture is warranted. Her is my pic, you can see Mr. Nibbles happily playing. I am sure he was thanking his friend Sawyer for the nice gesture along with reminding him less is more. Thank you Sawyer for sharing with the turtles and entertaining Mommy and Daddy. I so wanted to name my son Sawyer but my hubby just wasn't down with it. It's such a great name!! Thank you for you comment PK! That was sweet of her, of course fish want icecream! Too cute! Thanks for your comment!